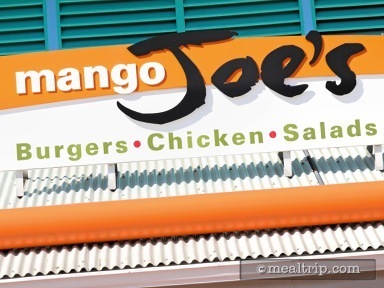 Mango Joe’s® offers outdoor covered and open air seating in a tropical, castaway theme. 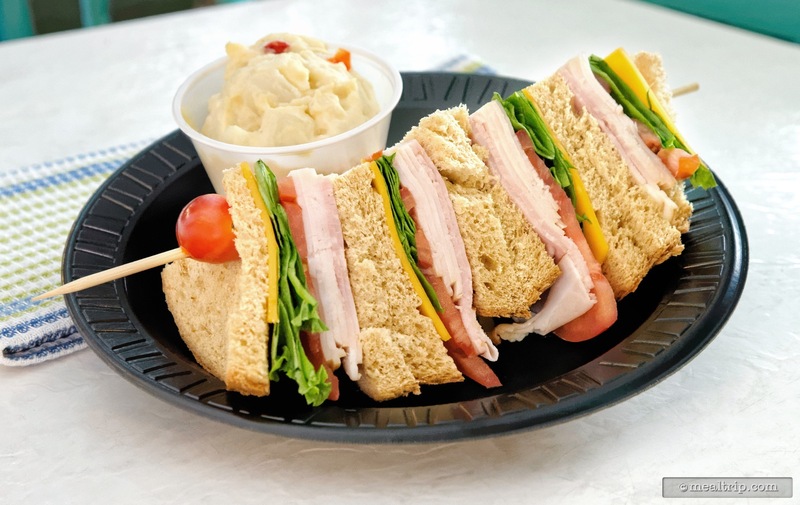 Fare ranges from their namesake “Mango Fruit Salad” but also includes turkey ham or chicken salad sandwiches and single or double grilled burgers, garden burgers (the meatless option) and hot dogs. I enjoyed the very fresh and healthy mango salad. All of the items in the salad was delicious. This salad was as beautiful just like the photo. 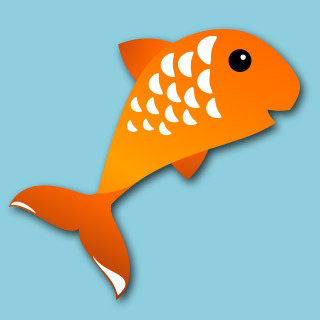 I highly recommend this item. The only challenge here is locating a table downwind of the plants all around the area. 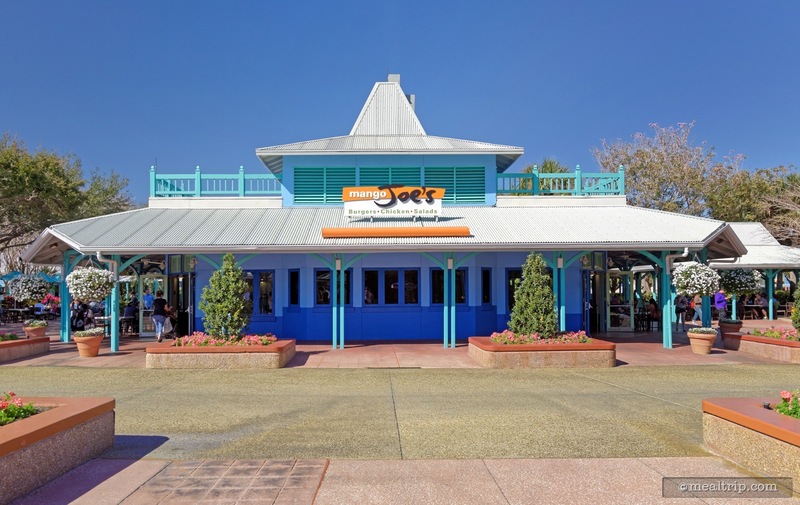 SeaWorld Orlando's "Mango Joe's" is one of those locations where you just expect to find the same-old burgers and fries or hot dogs. 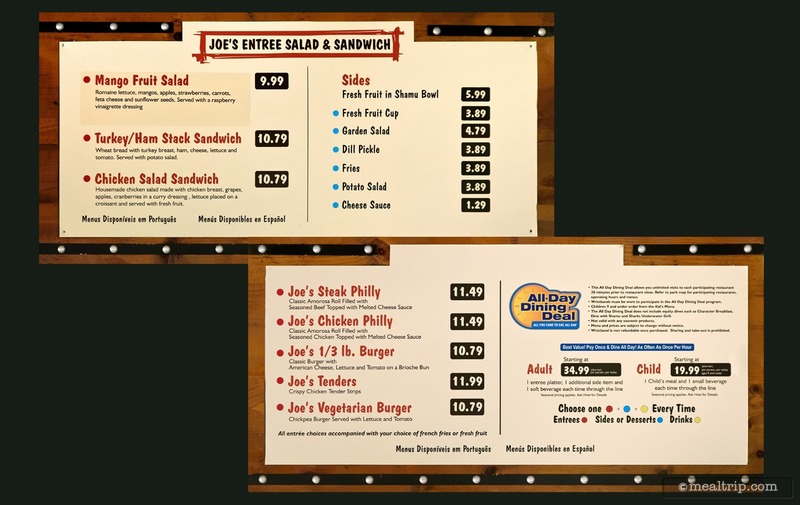 Those things are available but there's a three-item "salad and sandwich" menu that's quite refreshing to see at an in-park fast-food dining spot. Today we're looking at the Turkey & Ham Stack Sandwich which is… stacked, but laying down with a giant wooden skewer through the middle of it, to keep the whole sandwich together. 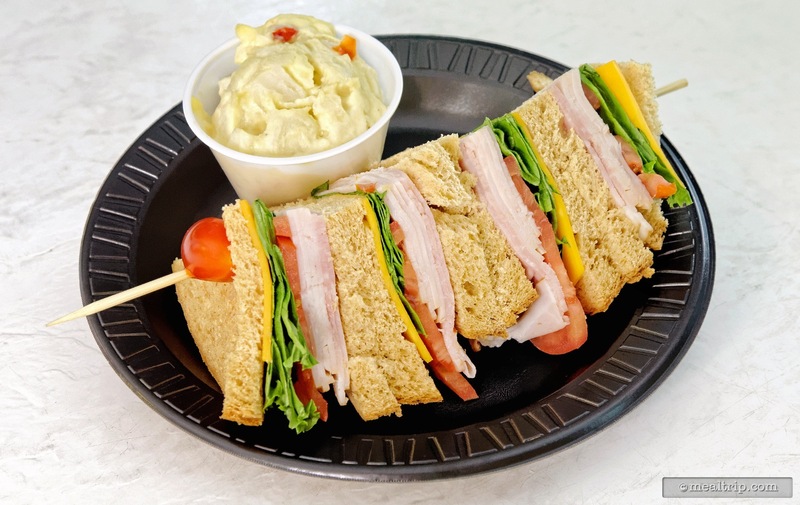 Wheat bread with turkey and ham, a fairly mild American-like yellow cheese, lettuce and tomato make up the layers. Small packets of mayo and mustard are available, but as far as I could tell, the sandwich was made "dry". The side item here is a cup of potato salad. It is a whole sandwich, cut in fours, and poked together to form a giant sandwich triangle. 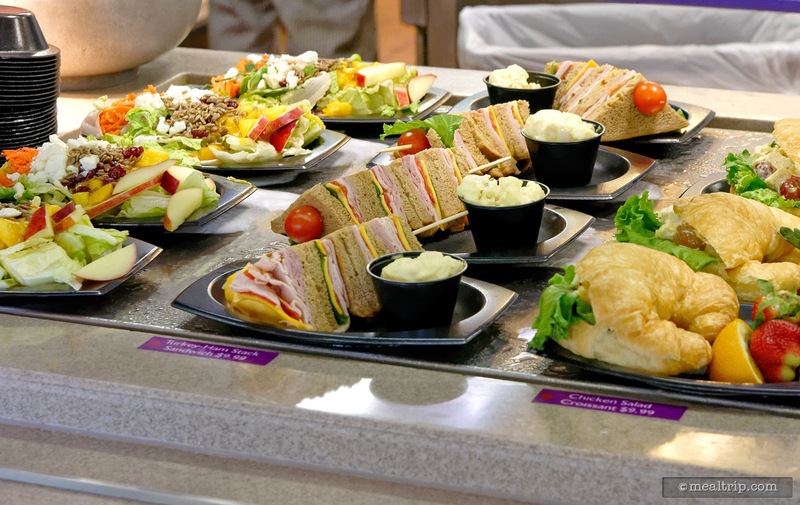 There' nothing in the large (definitely shareable) sandwich platter that will make you say "wow, I'll need to get another one of those on my next visit". It's a sandwich that we've all had at one time or another and are probably familiar with the flavors and textures. It's just nice to see something so un-fried and fresh-made as the sandwich was. Things to look out for… well as I said, this one is served "dry" so for those of you (and I'm one on them) that like a little mayo on your sandwiches, you'll have to mess with a tiny packet of squeezable mayo. That's not much fun. I also have to say, SeaWorld lettuce seems to be oddly dry (but green) at just about every location that uses lettuce. It's what I would call "display" lettuce. All in all, I think I have now tried all the specialty "salad and sandwich" options at Mango Joe's. The winning item here (for me anyway) would still be the Chunky Chicken Salad Sandwich with Curry Dressing on a Croissant. It's the one item that I would totally re-order and had a bit of that "wow" factor I'm always looking for. 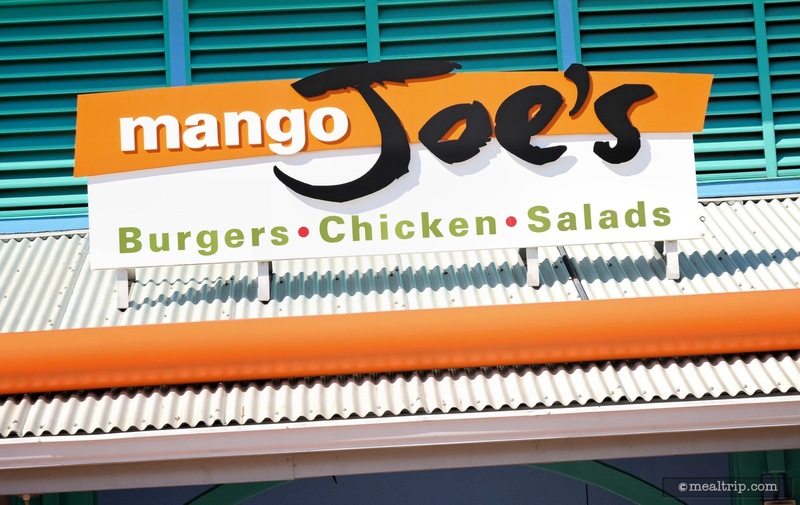 Mango Joe's is a quick service restaurant, tucked in a slightly out-of-the-way pocket area at SeaWorld Orlando (listed on the map as the "Sea of Power") and as such it doesn't seem to get much attention. That's really too bad because they have a couple of great, healthful options that can be hard to find at other SeaWorld counter service locations. The Mango Joe's building itself has a rather small looking facade that's located in a very large courtyard between Shamu Stadium and the Wild Arctic attraction. Even though there's actually two food pick-up and payment lines on either side of the building, it still "seems" small. Both lines are open only during extreme peek dining periods though, so you'll usually only find one side open at any given time. Most of Mango Joe's seating, is actually hidden behind the restaurant, and that's what makes this location a bit of a hidden gem. 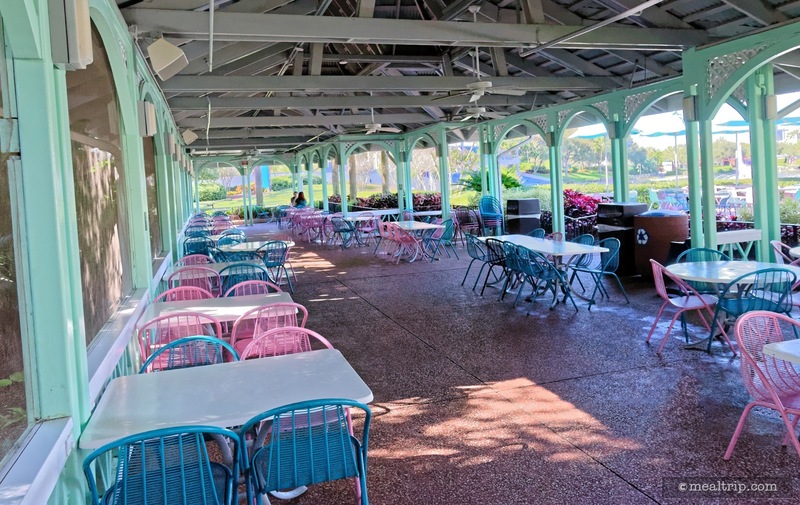 Only guests that are willing to explore a bit ever find the fully covered patio seating area around back. We have even been to Mango Joe's around what would be considered an early dinner time (4:30pm-ish) and have had the entire patio to ourselves! 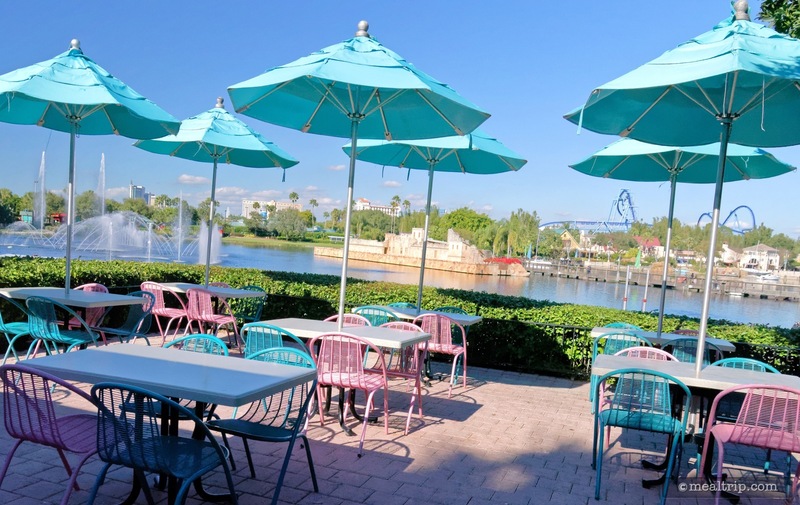 While there's not much going on, the view across Bayside Lagoon is peaceful and can provide a quiet break from the hustle and bustle that surrounds other quick service dining locations at SeaWorld. This is one location that can get swamped with guests though, especially right after the main Shamu Stadium show lets out. If things seem backed up… they won't be in a half hour. 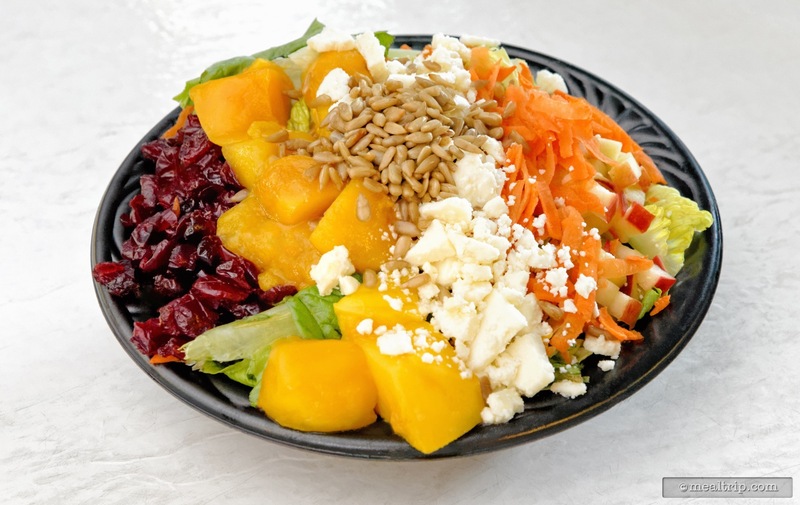 For lunch, I decided to try out Mango Joe's signature salad, the "Mango Fruit Salad". I wish they would change the name to "Mango Joe's Signature Salad" actually, because the term "fruit salad" kind of has you thinking this is something else. The salad really is an entree-sized, meal type dish, and not a sweet, syrupy fruit cocktail type of side-item. 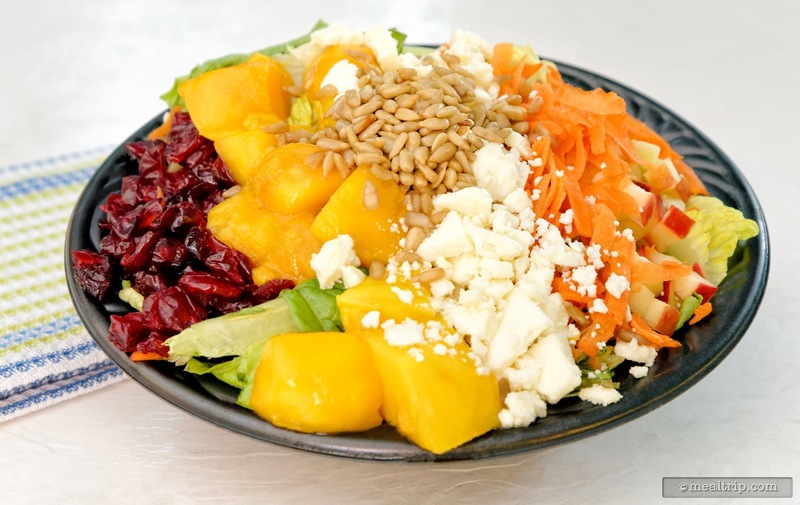 Combining real (not dried) chunks of cut mango with carrots, dried cranberries, sunflower seeds, some feta cheese, and a few diced apples, the mix is an honest to goodness, genuine salad… and there's even some green lettuce under all of that stuff! If you don't like fresh mangos, this dish isn't going to change your mind… they are yummy, but some find the golden tropical fruit to be a bit slimy when cut like this. The only missed opportunity here (from a culinary standpoint) is that there's not a house-made dressing. SeaWorld seems to use various pre-packaged salad dressings at just about every location, except for Sharks Underwater Grill. Which is fine. I totally understand why… and this time, for just this one salad… it totally gets a pass from me. Mostly because the Mango Salad is practically good enough to eat without any dressing. Like most of the salads we've found at SeaWorld, you may want to ask for a spare plate before digging in. 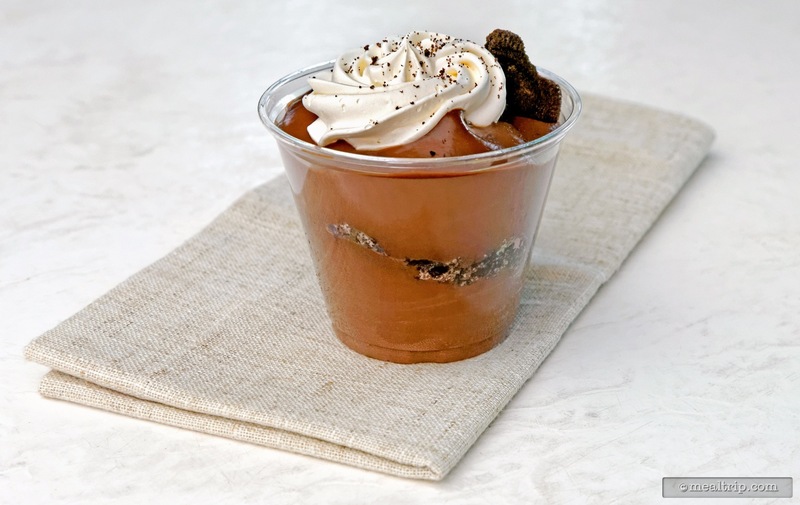 They put all of the great looking stuff on top, and if you eat it that way… you'll end up with a bowl of lettuce. I find that deconstructing their salads a little bit onto a spare plate helps spread things out, and allows you to get a more even mix of the components. 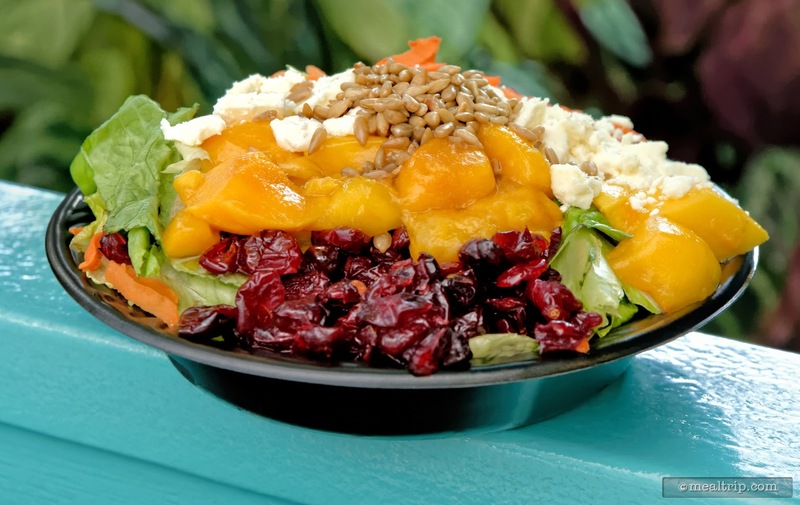 Between this Mango Salad, a great Chicken Salad Croissant and a multi-level Turkey and Ham Stack Sandwich, what Mango Joe's lacks in immersive theming, it makes up for with great food options… that might just be a little better for you than some of the more commonly found items at other counter service locations. 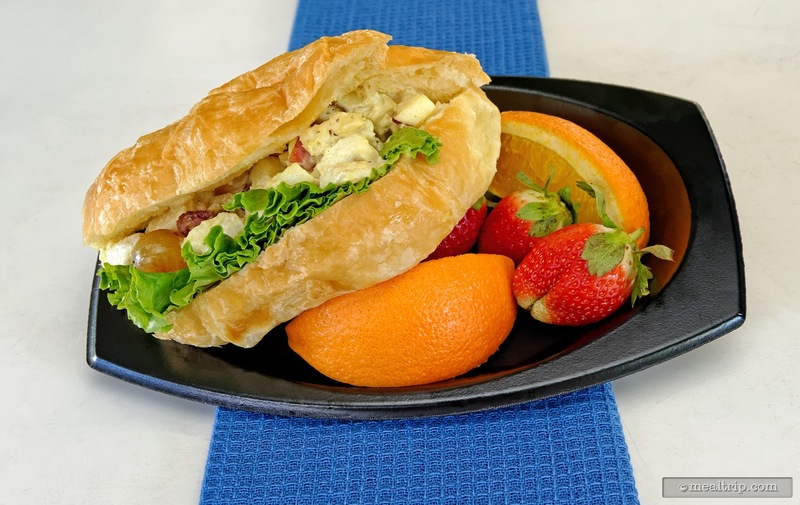 The chicken salad sandwich was served on a light croussant bun with apple bits and raisans. It was a delicious sandwich I wish they made it in front of me instead of being sitting in a display to pick up. 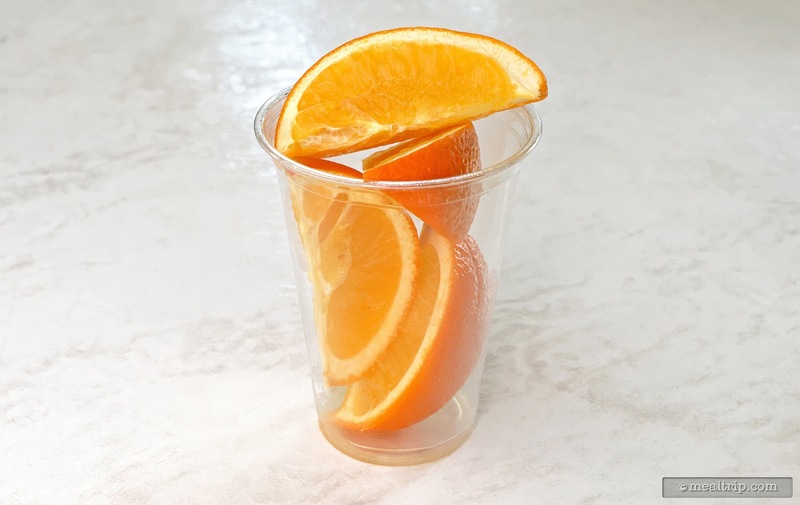 It was also served with 2 strawberries and 2 orange slices that were both perfect. I would recommend this light sandwich. You have to pick a seat outdoors that is not down wind of certain smells of the plants. CLICK HERE to view all 12 images in our photo gallery.